When I moved to the Gracious Southside in 2002, I left Bellevue, where I was just a mile from the then-biggest drug nuisance in the City, the Redwood Apts. (2d biggest if you count RRHA). Here, I found myself a mile and a half from the second largest, the Midlothian Village (3d largest if you count RRHA). At the time, the Old South Neighborhood Team had the Village on its radar; the then new owners at the Village decided they would rather talk than fight. We’ve since had monthly breakfasts with the management and the 211 Sector Lieutenant, and we’ve seen some progress. The current owner (third in my time) has installed a first rate manager, Cheyanne Williams, and is taking serious steps to control the place: Upgraded off-duty security, more cameras and lights, fixing the fences, and more. The Feds tell us that the key to controlling drug and other disorder on rental property is the management. It’s true. Police can only do so much. Whether as to drug activity or other disorder, the landlord is the only entity that can make the physical changes to the property, evict the troublesome tenants, hire the security, control the access, and enforce the lease terms as necessary to make the property safe. We also are blessed with a fine Sector Lieutenant in 211, Faith Flippo. And the Councilman, Parker Agelasto, has been most helpful; he has missed very few breakfasts (in contrast to his predecessor, who missed them all). The flaw in this pretty picture is our General District Court Judge, David Hicks. We saw a facet of that this morning. One persistent, young troublemaker at the Village has been Kyreek Carter. Cheyanne banned him months ago. He kept coming back, despite, at last count, twenty-two warrants for criminal trespass. The criminal trespass statute is one of the most useful tools for managing rental property. The statute was passed in the bad old days as a tool to prevent sit-ins. Nowadays, it helps property management keep troublemakers off the property. Our former General District Judge, Gregory Rupe, was wonderful: First trespass warrant got a warning and suspended sentence. Second one got jail time. Most folks, hearing about the judge’s rep, got the idea after the first visit with him. Mr. Carter looks to have graduated from trespass to more serious matters. 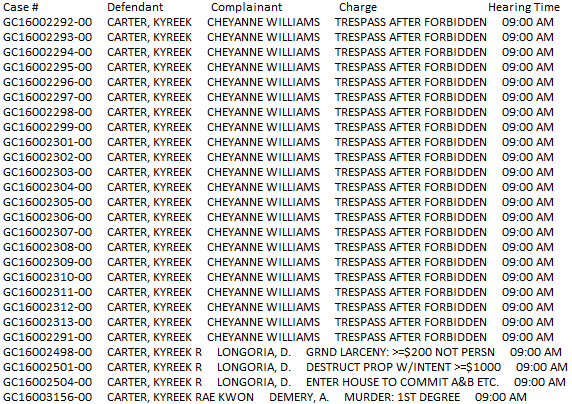 The docket this morning showed the trespass charges along with grand larceny/property destruction/unlawful entry and, to cap the list, conspiracy to commit the murder at the Village on May 8. 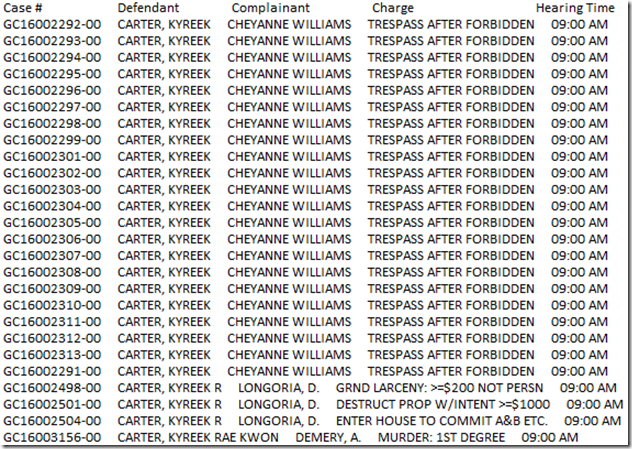 Six other trespass charges dismissed (“Six” is what I heard; no telling what happened to the other ten). The larceny et al. and murder charges were put off to later. There’s no indication whether any of the fines/costs ever was paid. More to the point, repeated trespass convictions, one with and two following the drug paraphernalia conviction, produced repeated wrist slaps, not jail time. This judge is NOT on our side. Through his antisocial generosity, Carter now is on the streets Mondays through Fridays. And, unfortunately, if Carter shows up again at the Village (I’ll bet you a picture of Judge Hicks that he will), he’ll go back to the same gentle jurist. Thank Goodness the murder rap will wind up in Circuit Court, where Carter is likely to encounter a judge who is willing to do the job. We have some issues that are even closer. The apartments in the 400 and 600 blocks of Westover Hills have been problems for a while. My ToDo list includes pulling some more current data. For now, I’ll just notice that Chief Durham conducted a Command Staff walk there on July 12.